Miyazaki Hayao’s masterpiece "Nausicaä of the Valley of the Wind" [manga | movie] will be adapted into Kabuki in 2019! It will be staged in December 2019 at the Shinbashi Enbujô with Onoe Kikunosuke and Nakamura Shichinosuke in the roles of Nausicaä and Kushana [more details]. 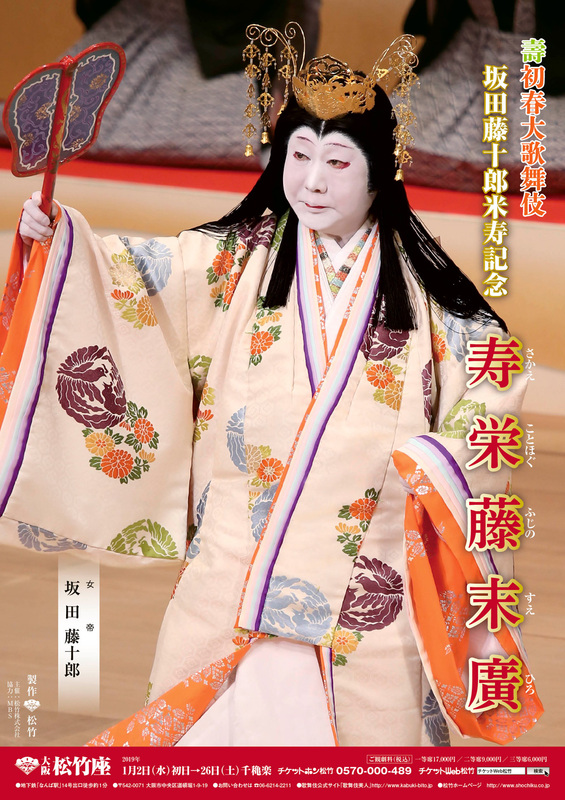 The two programs for the February Grand Kabuki performances at the Kabukiza, have been published. There will be 5 Living National Treasures on stage: Onoe Kikugorô, Nakamura Kichiemon, Bandô Tamasaburô, Kataoka Nizaemon and Nakamura Tôzô. 3 dramas will be staged to commemorate the 32nd anniversary (33rd memorial services) of the passing away of Onoe Tatsunosuke I: "Sushiya", "Kurayami no Ushimatsu" and "Meigetsu Hachiman Matsuri" [more details]. A troupe of young actors led by Kataoka Ainosuke will perform in Fukuoka at the Hakataza in March 2019 to to celebrate the 20th anniversary of the opening of this theater [more details]. Nakamura Shichinosuke will be on tour in March 2019, visiting 12 cities [more details]. In 2019, the Grand Kabuki Tour in the central provinces will happen in April, not in July. Matsumoto Hakuô II and his son Matsumoto Kôshirô X will celebrate their shûmei in different central cities [more details]. 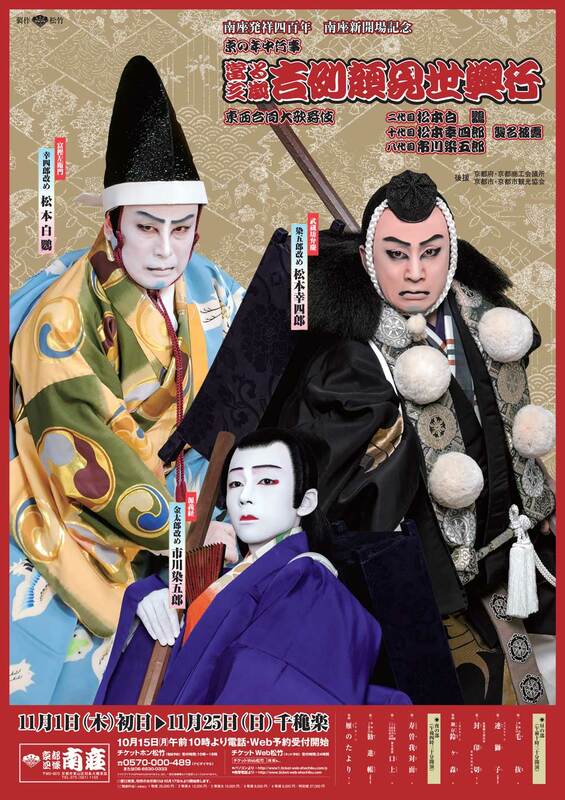 The 35th edition of the Spring Kabuki performances (Shikoku Konpira Kabuki Ôshibai) at the Kanamaruza on Shikoku island will happen between the 6th and the 21st of April 2019. The troupe will be led by Nakamura Senjaku, Nakamura Kankurô, Nakamura Shichinosuke, Ichikawa Chûsha and Kataoka Kamezô. 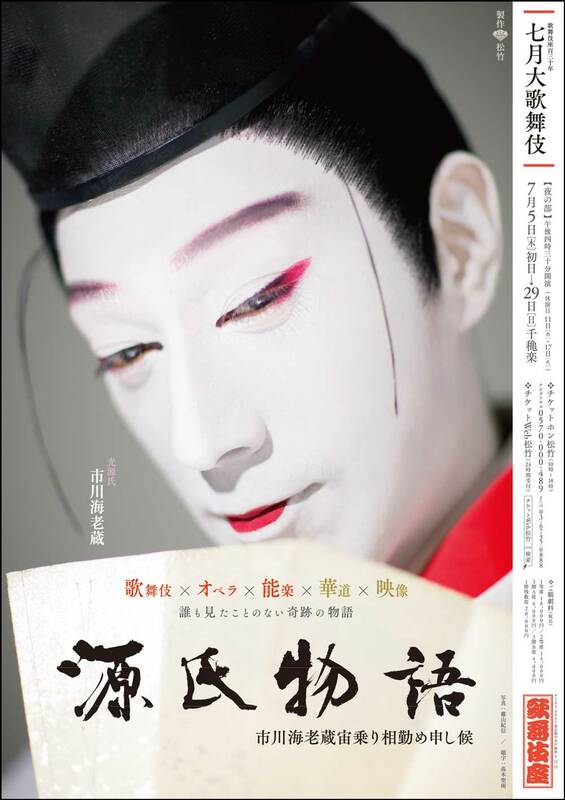 The newly-created Kabuki drama "Shinjû Tsukiyo no Hoshinoya", which was premiered in August 2018 at the Kabukiza, will be staged at the Kanamaruza [more details]. Nakamura Shikan, Kataoka Ainosuke and Onoe Shôroku will perform in "Hakkenden" in April 2019 in Nagoya at the Misonoza [more details]. Ichikawa Ebizô, along with Ichikawa Udanji and with Nô performers, will be on tour all over Japan (11 cities) from the 9th to the 25th of April 2019. This tour will be as usual entitled Koten he no Izanai, literally "Invitation to the Classics" [more details]. The 6th edition of Ginza Kobikitei, an event with rakugo and kôdan storytellers will happen the 25th of January 2019 at the Kabukiza Gallery (5th floor of the Kabukiza building). The rakugo storyteller will be Kokontei Bungiku, who will start his performance at 19:00 and tells the famous rakugo of "Yodogorô". The kôdan storytellers will be Kanda Kyôko and Kanda Matsunojô. All the stories will be Kabuki-related. 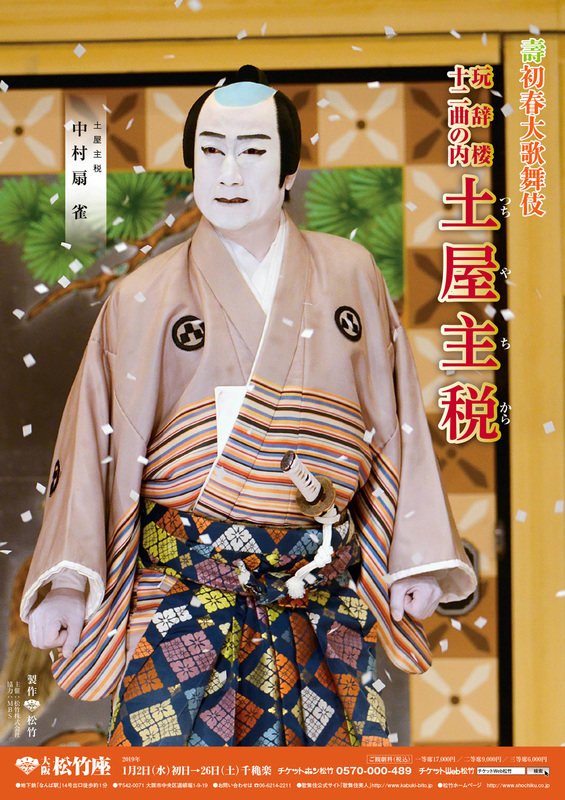 Nakamura Ganjirô playing the role of Kamiya Jihê in the drama "Kawashô"
Sakata Tôjûrô performing in "Sakae Kotohogu Fuji no Suehiro"
Kataoka Ainosuke performing in "Kinmon Gosan no Kiri"
The two programs for the New Year Kabuki Performances at the Shinbashi Enbujô in January 2019 have been published [more details]. A special dance will celebrate the 110th anniversary of the birth of Ichikawa Danjûrô XI. It will be entitled "Natorigusa Hana no Jûichidai" and Ichikawa Ebizô will perform with both his son Horikoshi Kangen and his daughter Horikoshi Reika. The two programs for the New Year Kabuki Performances at the Kabukiza in January 2019 have been published [more details]. The zagashira will be Living National Treasure Nakamura Kichiemon. He will play the role of Takechi Mitsuhide in the drama "Ehon Taikôki". Living National Treasure Bandô Tamasaburô will perform in a special program in March 2019 in Kyôto at the Minamiza [more details]. He will play the role of Akoya in the eponymous drama "Akoya" and he will perform in the newly-created dance-drama "Keisei Yuki no Yoshiwara", which was premiered in December 2018 at the Kabukiza. The third edition of the Roppongi Kabuki performances at the EX THEATER in Roppongi will also be staged in Ôsaka and in Sapporo. In Ôsaka, it will be staged from the 13th to the 17th of March 2019 at the Orix Theater [more details]. In Sapporo (Hokkaidô), it will be staged from the 21st to the 24th of March 2019 at the Wakuwaku Holiday Hall (Sapporo Civic Hall) [more details]. Based on Akutagawa Ryûnosuke's short story "Rashômon", the stage direction will be done by the famous movie director Miike Takashi, an expert in violent and bizarre movies who worked twice with Ichikawa Ebizô for the movies "Hara-Kiri: Death of a Samurai" (2011) and "Over your Dead Body" (2014). The 5th edition of Ginza Kobikitei, an event with rakugo and kôdan storytellers will happen the 12th of December 2018 at the Kabukiza Gallery (5th floor of the Kabukiza building). The rakugo storyteller will be Irifunetei Sen'yû, who will start his performance at 19:00 and tells the famous rakugo of "Bunshichi Mottoi". The kôdan storytellers will be Kanda Matsunojô and Kanda Aizan II. All the stories will be Kabuki-related [more details in Japanese]. There won't be any Kabuki performance in Fukuoka at the Hakataza in February 2019. There is usually one or two programs in February since 2000, with only one exception, the year 2009. Will all the February in a year ending with a nine be a kabukiless month in Fukuoka ? Prior to Kyôto's year-end kaomise Kabuki performances from the 1st to the 26th of December 2018 [more details], the annual maneki-age happened the 26th of November 2018 at the Minamiza. During this important event, huge wooden boards called maneki kanban are raised. The boards feature the names of Kabuki performers appearing in the show and they were placed over the front of the Minamiza on a huge takeyarai. The maneki kanban were made by the calligrapher Inoue Yû IV at the Myôdenji temple in Kyôto. The calligrapher soaked his brush in special ink mixed with sake for the purpose of purification and glossing, and wrote the names all actors with strong strokes in kanteiryû characters [pictures and more details in Japanese]. All Nippon Airways goes Kabuki with a new inflight safety video! This Kabuki-powered video will be released from the 1st of December 2018 in domestic flights and from the 1st of January 2019 in international flights [more details]. The 3rd of November 2018, Ôoka Hideaki, the 15th generation "head" of the Ôoka Clan (a symbolic head as there is no more daimyô in Japan for more than 150 years), went with his wife to the National Theatre and met the stars performing in "Na mo Takashi Ôoka Sabaki", a Kabuki drama about Ôoka Tadasuke, the 5th generation daimyô of the Ôoka Clan and his ancestor [pictures and more details in Japanese]. The 24th of November 2018, two important dance masters, Fujima Kanjûrô VIII and Onoe Kikunojô III, performed at the Kabukiza Gallery (5th floor of the Kabukiza building) in the Tokiwazu-based dance-drama "Modori Kago Iro ni Aikata". This was the 1st edition of a special evening Buyô program at a performance space called the Shibai-yomoyawaza. Nakamura Shikan VIII and his three sons, Nakamura Hashinosuke IV, Nakamura Fukunosuke III and Nakamura Utanosuke IV, will celebrate their shûmei in Honolulu from the 2nd to the 8th of March 2019. The program is entitled 2019 Honolulu Kabuki and it will be staged at the Kennedy Theatre at the University of Hawaii at Manoa and at the Hawaii Convention Center. They will perform in "Renjishi". This will be part of a series of events commemorating the 150th anniversary of Japanese Emigration to Hawaii [more details]. Matinée: Nakamura Kazutarô will play seven roles in Tsuruya Nanboku IV's masterpiece "Osome no Nanayaku" under the supervision of Living National Treasure Bandô Tamasaburô. Onoe Matsuya will play the leading role of "Kôsuke Mochi", a drama associated to the Nakamura Ganjirô line of actors. Program A: staged the 2nd, 3rd, 6th, 7th, 10th, 11th, 13th, 14th, 17th, 18th, 20th, 21st, 24th and 26th of December 2018. Living National Treasure Bandô Tamasaburô will play the prestigious role of Akoya in the eponymous drama "Akoya". Nakamura Baishi and Nakamura Kotarô will perform in "Ninin Fuji Musume", the "Two Wisteria Maidens". Program B: staged the 4th, 5th, 8th, 9th, 12th, 15th, 16th, 19th, 22nd, 23rd and 25th of December 2018. The role of Akoya will be played for the very first time by two young onnagata actors: Nakamura Baishi (4th, 8th, 12th, 16th, 22nd and 25th of December 2018) and Nakamura Kotarô (5th, 9th, 15th, 19th and 23rd of December 2018). Living National Treasure Bandô Tamasaburô will play for the very first time the comical role of Iwanaga Saemon, a male villain role! He will also be the star of the newly-created dance-drama "Keisei Yuki no Yoshiwara". 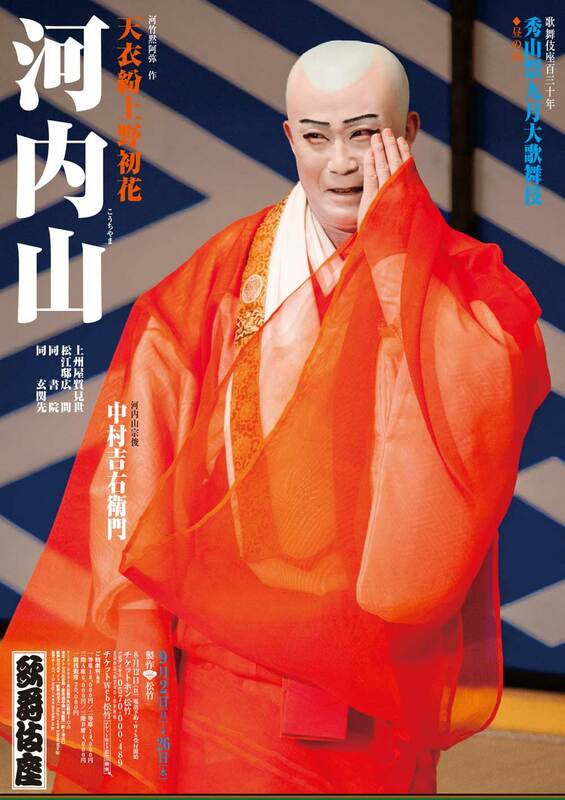 Namiki Gohei I's 1780 drama "Sode Nikki Banshû Meguri" will be revived under the title "Himeji-jô Oto-ni Kiku Sono Ishizue" at the at the National Theatre in January 2019. As this is usually the case for the new year program, the zagashira will be Living National Treasure Onoe Kikugorô [more details]. Two classics of the Nakamura Ganjirô line of actors, which belong to the Ganjirô Jûnikyoku collection of plays: "Tsuchiya Chikara" and "Kawashô". The revival of Namiki Gohei I's spectacular drama "Kinmon Gosan no Kiri" in the keren-powered version crafted by Ichikawa Ennosuke III with with Kataoka Ainosuke in the role of Ishikawa Goemon. The 27th of October 2018, there was a huge parade in Kyôto on the famous Shijô Avenue, from the Minamiza theater to the western gate of the Yasaka Shrine. 69 kanbu actors took part in this event [pictures and more details in Japanese]. The two programs for the New Year Asakusa Kabuki at the Asakusa Kôkaidô in January 2019 have been published [more details]. Prior to Kyôto's year-end kaomise Kabuki performances at the Minamiza, from the 1st of November to the 25th of November 2018 [more details], the annual maneki-age happened the 25th of October 2018. During this important event, huge wooden boards called maneki kanban are raised. The boards feature the names of Kabuki performers appearing in the show and they were placed over the front of the Minamiza on a huge takeyarai [picture]. The maneki kanban were made at the Myôdenji temple in Kyôto. The calligrapher soaked his brush in special ink mixed with sake for the purpose of purification and glossing, and wrote the names of actors with strong strokes in kanteiryû characters [pictures and more details in Japanese]. Living National Treasure Kataoka Nizaemon was put the 26th of October by the Japanese Ministry of Education, Culture, Sports, Science and Technology in the list of Japanese personalities who have made outstanding culture contributions in Japan in 2018 (bunka kôrôsha) [pictures and more details in Japanese]. The 1st of October 2018, the opening day (shonichi) at the National Theatre was attended by Naruhito, the Crown Prince of Japan, and his wife, Princess Masako [pictures and more details in Japanese]. The third edition of the Roppongi Kabuki performances at the EX THEATER in Roppongi will happen in February 2019 and March 2019 [more details]. Based on Akutagawa Ryûnosuke's short story "Rashômon", the stage direction will be done by the famous movie director Miike Takashi, an expert in violent and bizarre movies who worked twice with Ichikawa Ebizô for the movies "Hara-Kiri: Death of a Samurai" (2011) and "Over your Dead Body" (2014). The 9th edition of the Sistine Kabuki, a Kabuki program led by Kataoka Ainosuke within the Sistine Hall of the Ôtsuka Museum of Art which is located in the city of Naruto (Tokushima prefecture), will happen in February 2019. A newly-created play entitled "TAMETOMO" will be staged 6 times over 3 days [more details]. The 29th of October 2018, Matsumoto Hakuô II, his son Matsumoto Kôshirô X and his grandson Ichikawa Somegorô VIII went to the Yasaka Shrine in Kyôto to pray for the success of the November 2018 performances in Kyôto at the Minamiza [pictures and more details in Japanese]. Nakamura Jakuemon will be the guest star of a special kodomo shibai program, which will be staged in Tôkyô in Ginza within the Taimei Elementary School the 3rd of November 2018. The young actors will be children belonging to the school and they will perform in "Yoshinoyama" and the "Inasegawa Seizoroi" scene of "Shiranami Gonin Otoko". Nakamura Jakuemon will talk on stage at the beginning of the program, which is entitled "Shintomiza Kodomo Kabuki in Ginza". This will be the seventh edition. Onoe Ukon, who is also the music master of Kiyomoto Eijudayû VII, will perform as a Kiyomoto musician in November 2018 at the Kabukiza in the drama "Izayoi Seishin". In the same programs, as an actor, he will also play the roles of Okon and Okumi in "Oedo Miyage" and "Hôkaibô". The 4th edition of Ginza Kobikitei, an event with rakugo and kôdan storytellers will happen the 16th of November 2018 at the Kabukiza Gallery (5th floor of the Kabukiza building). The rakugo storyteller will be Hayashiya Shôjaku, who will start his performance at 19:00. The kôdan storytellers will be Kanda Matsunojô and Kanda Ran. All the stories will be Kabuki-related [more details in Japanese]. Ichikawa En'ya has started to perform outside Kabuki at the end of October. He plays in the modern drama "Otoko no Junjô" ("The Pure Heart of Men"). In Tôkyô at the Kinokuniya Hall from the 25th of October to the 1st of November. Then on tour from the 2nd to the 24th of November [more details in Japanese]. The two programs for the traditional yearly kaomise in Kyôto at the Minamiza have been published. The troupe will be led by Living National Treasures Sakata Tôjûrô and Kataoka Nizaemon. The former actor will play a family role: Kameya Chûbê in "Ninokuchi-mura". The latter actor will play the roles of Minobe Iori and Igami no Gonta in "Jiisan Baasan" and "Sushiya" [more details]. The two programs for the kaomise at the Kabukiza in November 2018 have been published. The troupe will be led by Living National Treasures Onoe Kikugorô and Nakamura Kichiemon [more details]. The Zenshinza troupe will perform in October 2018 at the National Bunraku Theatre (Ôsaka) [more details] and in January 2019 at the Kyôto Gekijô [more details] in the drama "Ura Nagaya Sôdôki", which was written by the veteran movie director Yamada Yôji and was premiered in May 2017 at the National Theatre. This drama mixes two famous rakugo stories, "Rakuda" and "Ido no Chawan". Segawa Jokô III's 1861 drama "Zôho Futatsu Domoe", commonly called "Ishikawa Goemon", will be revived in December 2018 at the National Theatre [more details]. The troupe will be led by Living National Treasure Nakamura Kichiemon, who will play the spectacular role of Ishikawa Goemon. This revival will include the rarely-staged "Mibu-mura" act. Prior to Nagoya kaomise Kabuki performances from the 1st to the 25th of October 2017 [more details], the maneki-age happened the 8th of September 2018 at the Misonoza. During this important event, huge wooden boards called maneki kanban were raised. 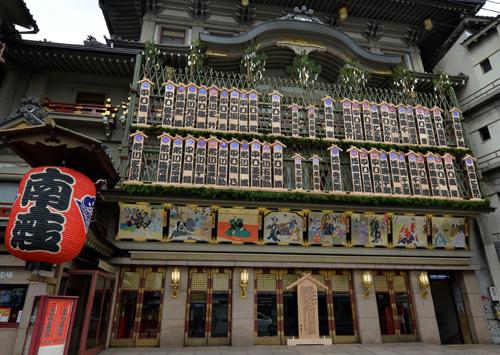 The boards feature the names of Kabuki performers appearing in the show and they were placed over the front of the venue on a huge takeyarai. To make the maneki kanban, the calligrapher soaked his brush in special ink mixed with sake for the purpose of purification and glossing, and wrote the names of all major actors with strong strokes in kanteiryû characters. There was a ceremony with Living National Treasure Onoe Kikugorô and Nakamura Baigyoku [pictures and more details in Japanese]. Kataoka Ainosuke and Nakamura Kazutarô will perform the 13th of October 2018 on a temporary stage at the Daisen Park in the city of Sakai [more details]. This will be the 37th edition of the World Heritage Theater, theater performances in world heritage sites in Japan. Mozu Kofungun, the Mozu Tombs in Sakai. Matsumoto Kôshirô will perform the 22nd October 2017 at the Shibuya-ku Bunka Sôgô Center Ôwada (Tôkyô) in "Shibuya Konnômaru Densetsu", along with the dance masters Onoe Miyako and Gojô Tamatarô [more details]. Ichikawa Udanji III and Ichikawa Sai'nyû II, ahead of their coming shûmei performances in Ôsaka in October 2018 at the Shôchikuza, went to the Kôzu Shrine the 7th of September 2018 to pray for the success of the performances. There was also a parade in the Dôtonbori district, the heart of Ôsaka [pictures and more details in Japanese]. They also went to pray at the tombstone of both Ichikawa Sai'nyû I and Ichikawa Udanji II in the Isshinji Temple in Ôsaka [pictures and more details in Japanese]. The Kabuki world had to wait 103 years to have a actor named Ichikawa Sai'nyû and an actor named Ichikawa Udanji sharing the same stage! 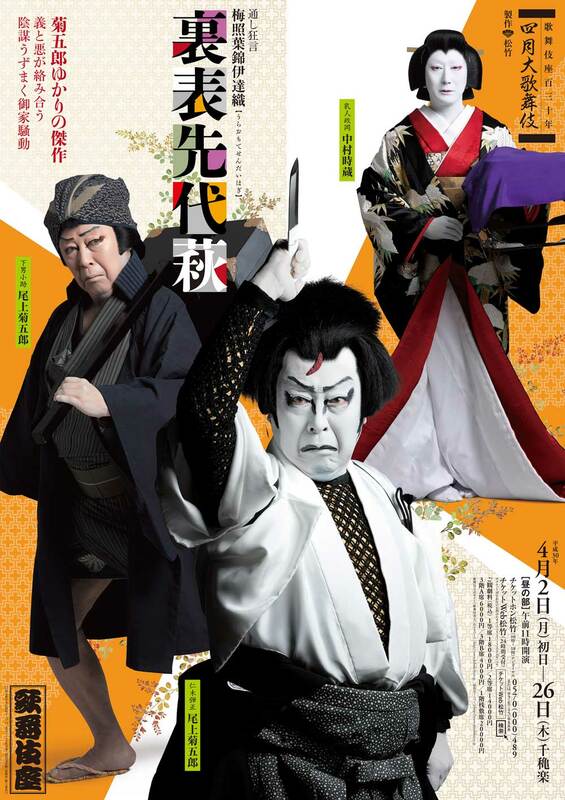 The latest release (32nd) in the Shinema Kabuki ("Cinema Kabuki") series, "Hototogisu Kojô no Rakugetsu" and "Yôkihi", which starred Living National Treasure Bandô Tamasaburô and were shot live in high definition in October 2017 ("Hototogisu Kojô no Rakugetsu") and December 2017 ("Yôkihi") at the Kabukiza, will be released all over Japan from the 12th of January 2019. Matsumoto Kôshirô and Ichikawa Somegorô in "Renjishi"
Matsumoto Hakuô, Matsumoto Kôshirô and Ichikawa Somegorô in "Kanjinchô"
A nengajô based on "Torii Maea"
A nengajô based on "Kinkakuji"
A nengajô based on "Soga no Taimen"
A nengajô based on "Musume Dôjôji"
A nengajô based on "Fuji Musume"
Kawatake Mokuami's ôoka-seidanmono drama "Ten'ichibô" will be revived in November 2018 at the National Theatre. The stars of this revival will be Nakamura Baigyoku, Nakamura Kaishun, Bandô Yajûrô, Bandô Rakuzen and Ichikawa Udanji. This production will be entitled "Na mo Takashi Ôoka Sabaki" [more details]. The Kabukiza will commemorate the 6th anniversary (7th memorial services) of the passing away of the Heisei star Nakamura Kanzaburô XVIII in October 2018, which will be temporarily built in Tôkyô in Asakusa. The two programs have been published [more details]. Nakamura Kankurô and Nakamura Shichinosuke will commemorate the 6th anniversary (7th memorial services) of the passing away of their father Nakamura Kanzaburô XVIII in November 2018 at the Heisei Nakamuraza, which will be temporarily built in Tôkyô in Asakusa. The two programs have been published [more details]. It will be possible to watch at the 2018 edition of the Japan Film Festival of San Francisco from the 28th of September to the 7th of October 2018 the Kabuki drama "Bunshichi Mottoi". This movie belongs to the Shinema Kabuki ("Cinema Kabuki") series. It was shot live by the famous movie director Yamada Yôji in October 2007 at the Shinbashi Enbujô [more details]. The 2nd edition of Ginza Kobikitei, an event with rakugo and kôdan storytellers will happen the 28th of September at the Kabukiza Gallery (5th floor of the Kabukiza building). The rakugo storyteller will be Shunpûtei Icchô, who will start his performance at 19:00. The kôdan storytellers will be Kanda Matsunojô and Kanda Aguri, who will start their performances at 21:15 [more details in Japanese]. Nakamura Kankurô, Nakamura Shichinosuke, Kataoka Kamezô and Nakamura Toranosuke will perform the 23rd of September 2018 on a temporary stage at the Tôdaiji Temple in Nara [more details]. Ichikawa Ennosuke, Onoe Ukon and Nakamura Takanosuke have been invited to perform the 20th and 21st of September 2018 at the 20th edition of the Kamigata Hanabutai (the Kamigata Association), a gala program sponsored by the Kamigata Culture and Entertainment Association since 1984. This association has continuously been hosting a performance called "Kamigata Hanabutai" at the National Bunraku Theatre in Ôsaka. This performance showcases various Kamigata geisha entertainment forms, not normally presented outside the tea houses [more details]. There will be a special 1-day "Kabuki for Beginners" program with Ichimura Manjirô and his two sons the 16th of September 2018 in the Cultural Center of the Kôtô Ward in Tôkyô [more details]. The 15th of Septmber 2018, it will be possible to celebrate the 210th anniversary of the premiere of Tsuruya Nanboku IV's drama "Toki-ha Ima Kikyô no Hataage", commonly called "Badarai no Mitsuhide". It was premiered in Edo at the Ichimuraza in the 25th day of the 7th lunar month of the 5th year of the Bunka era, which was the 15th of September 1808 in the western calendar. The 3rd of August 2018, we could have celebrated the 200th anniversary of the passing away of Sawamura Kunitarô I (1739~1818). This Kamigata onnagata actor died the 12th day of the 6th lunar month of the 8th year of the Tenmei era, which was the 15th of July 1788 in the western calendar. Ahead of the 49th kaomise performances in Nagoya at the Misonoza, Onoe Shôroku, Bandô Hikosaburô, Bandô Kamezô, Nakamura Baishi and Nakamura Mantarô were paraded in rickshaws the 26th of August 2018 in the streets of the famous Ôsu district in the heart of the Naka Ward in Nagoya. They went to the Banshôji Temple to pray for the success of October 2018 performances [pictures and more details in Japanese|more details about the performances]. The 11th edition in Tôkyô of a special program called "Shûzan Matsuri" (the festival of Shûzan) will be staged at the Kabukiza in September 2018. 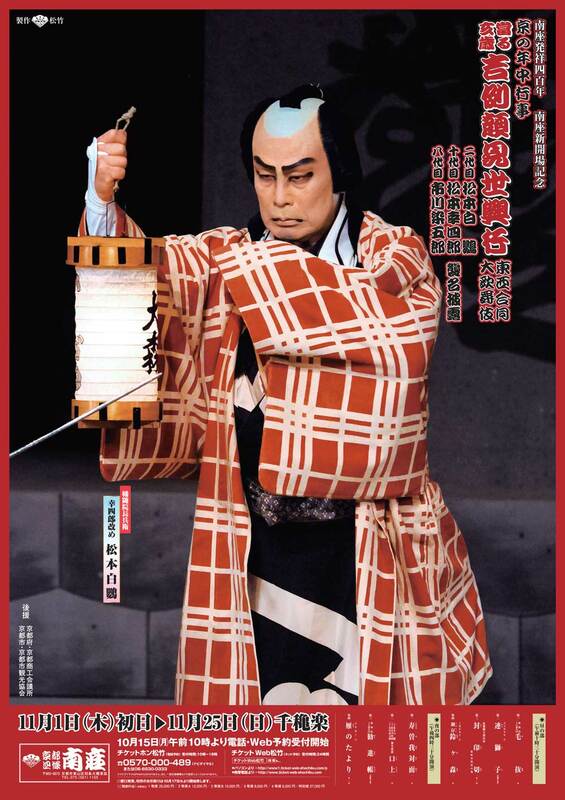 It will commemorate the great actor Nakamura Kichiemon I, whose's haimyô was Shûzan. The zagashira will be his adopted son, the Living National Treasure Nakamura Kichiemon II and the top guest star will be Living National Treasure Bandô Tamasaburô. A very good piece of news to be reported: Nakamura Fukusuke will be back on stage! Due to health issues, Nakamura Fukusuke had to stop acting in November 2013. It took him 4 years and 10 months before being able to perform in a Kabuki theater. In this program, he will play the role of the ama Keijuin in "Kinkakuji". 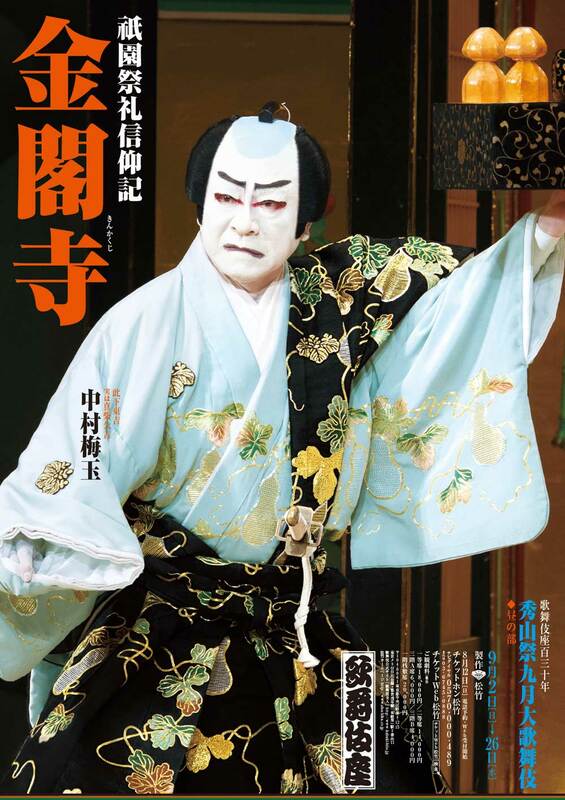 Another highlight of this September Grand Kabuki will be "Yûgen", a newly-created Kabuki Buyô starring Living National Treasure Bandô Tamasaburô, based on Nô dramas such as "Hagoromo" (The Feather Robe), "Dôjôji" (Dôjôji Temple) and "Shakkyô" (The Stone Bridge). 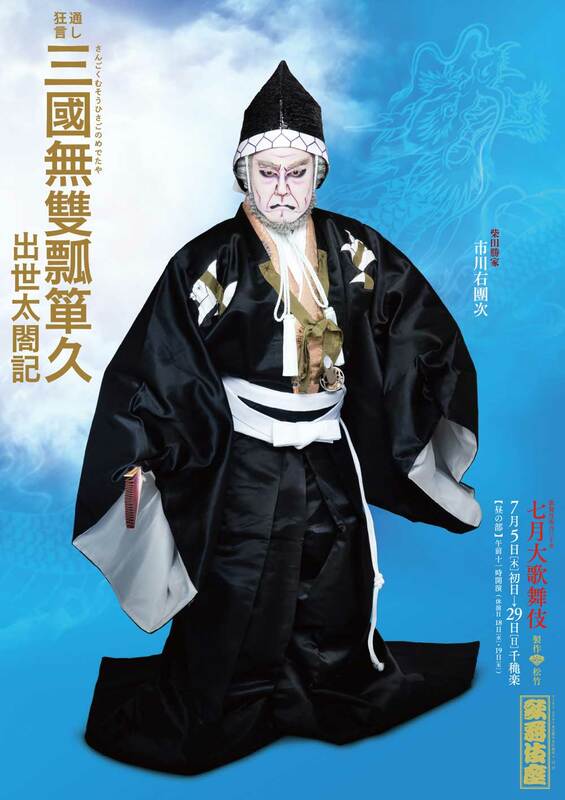 The zagashira of the troupe, Living National Treasure Nakamura Kichiemon, will play the roles of Kôchiyama Sôshun and Shunkan in the eponymous dramas "Kôchiyama" and "Shunkan" [more details]. Matsumoto Hakuô II, his son Matsumoto Kôshirô X and his grandson Ichikawa Somegorô VIII will celebrate their shûmei in November 2018 in Kyôto at the Minamiza [more details]. Matsumoto Hakuô will play the roles of Banzuiin Chôbê and Togashi in "Suzu-ga-Mori" and "Kanjinchô". Matsumoto Kôshirô will play the roles of the father shishi, Musashibô Benkei and Yorozuya Kinnosuke in "Renjishi", "Kanjinchô" and "Kari no Tayori". 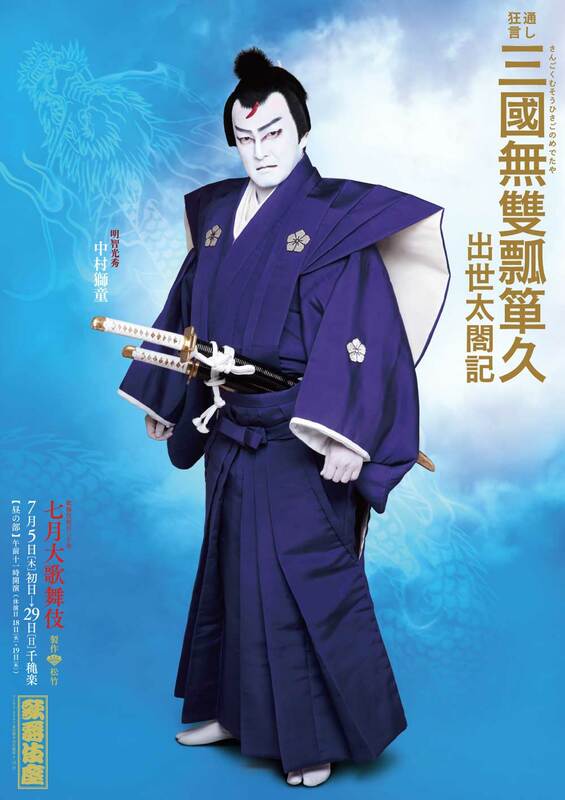 Ichikawa Somegorô will play the roles of the cub shishi and Minamoto Yoshitsune in "Renjishi" and "Kanjinchô". Two Living National Treasures, Sakata Tôjûrô and Kataoka Nizaemon, will perform in the troupe : the latter will play the roles of Kameya Chûbê and Kudô Saemon Suketsune in "Fûin Giri" and "Soga no Taimen" while the former will only appear in the kôjô. The two programs for the October Annual Festive Face-Showing Kabuki in Nagoya at the Misonoza in October 2018 have been published [more details]. The zagashira will be Living National Treasure Onoe Kikugorô. Ichikawa Udanji III and Ichikawa Sai'nyû II will celebrate their shûmei in October 2018 in Ôsaka at the Shôchikuza. 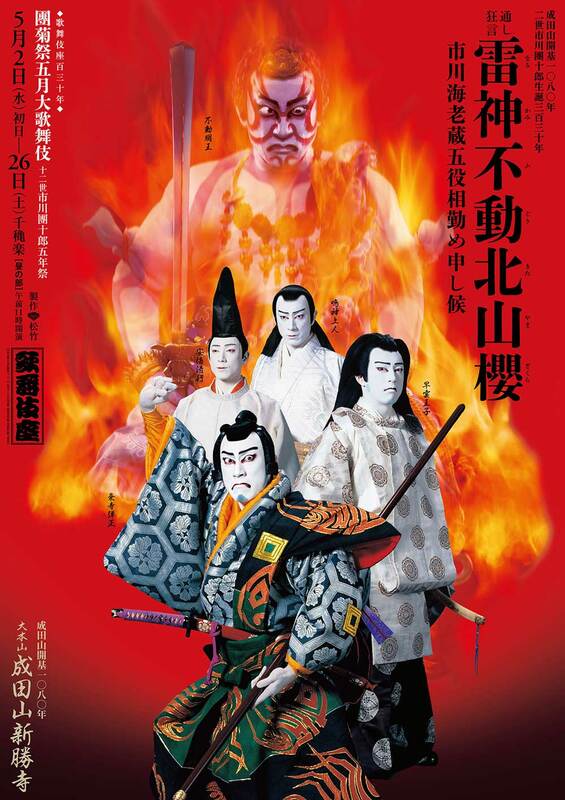 Major actors leading the troupe will be Ichikawa Ebizô, Ichikawa Ennosuke, Nakamura Jakuemon and Nakamura Ganjirô. Living National Treasure Sakata Tôjûrô will take part only in the kôjô. 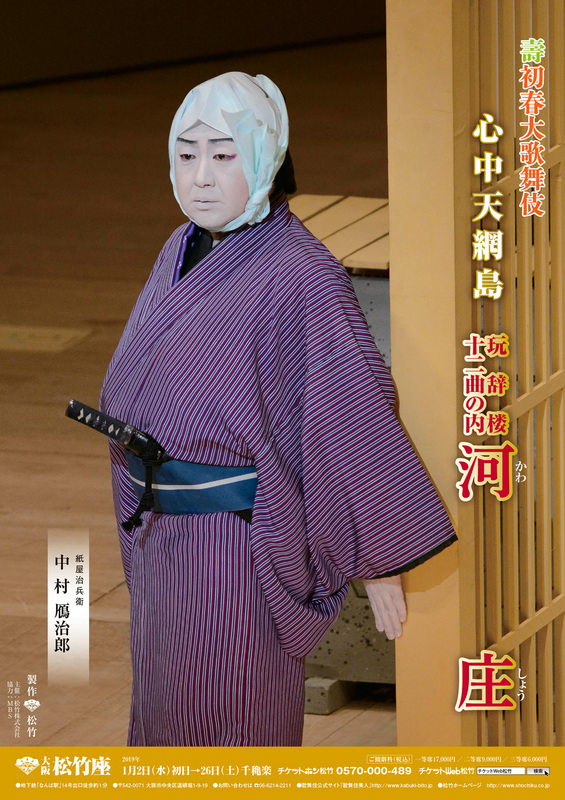 A newly-created Kabuki drama, entitled "Tamaya Seishichi", will be staged during the matinée. Chikamatsu Monzaemon's spectacular drama "Futago Sumidagawa" will be staged as the evening program. This drama, which belongs to the Ennosuke Jûhachiban, Ennosuke Shijûhassen and Fukkatsu Tôshi Kyôgen Jûhachiban collections of plays, will be the evening program [more details]. Nakamura Kankurô and Nakamura Shichinosuke will commemorate the 6th anniversary (7th memorial services) of the passing away of their father Nakamura Kanzaburô XVIII in October 2018 at the Kabukiza and in November 2018 at the Heisei Nakamuraza, which will be temporarily built in Tôkyô in Asakusa. The 11th edition of the Eirakukan Grand Kabuki will happen from the 18th to the 24th of October 2018 at the Eirakukan, a renovated traditional theater built in the city of Toyooka (prefecture of Hyôgo). The zagashira will be as usual the young star Kataoka Ainosuke. The first item in the program will be the classic "Benkei Jôshi". The second item was selected by a popular vote online. The members of the audience had to select one item in the list of the 10 dramas which were specifically created and staged as the second number in the program from the 1st to the 10th editions of Eirakukan Grand Kabuki. They've voted in majority for "Kô no Tori", which was premiered at the Eirakukan in November 2014 [more details]. The newly-created Kabuki drama "Arashi no Yoru ni", which was premiered in September 2015 in Kyôto at the Minamiza [more details], will be staged for the first time in Fukuoka at the Hakataza in November 2018 with almost the same casting [more details]. The two stars will be Nakamura Shidô and Onoe Matsuya. The 23rd of July 2018 was officially taisho, the traditional day of blistering heat. An event called uchimizu biyori (literally a good day for uchimizu) was held in front of the Kabukiza : around 300 people gathered in front of the theater to enjoy the tradition of uchimizu [pictures and more details in Japanese]. Living National Treasure Bandô Tamasaburô will perform at the Yachiyoza, a traditional wooden-built theater, from the 30th of October to the 4th of November 2018 [more details]. There will be a mix of video projection (with video sequences coming from the high-quality Shinema Kabuki, "Cinema Kabuki") and real dancing on stage. Ichikawa Ebizô will be on tour all over Japan from the 1st to the 22nd of September 2018 [more details] and from the 5th to the 30th of November 2018 [more details]. This tour will be as usual entitled Koten he no Izanai, literally "Invitation to the Classics". The 45th edition of Koten Geinô Kanshô Kai (literally the "Classics Entertainment Appreciation Association"), a yearly performance produced by the National TV network NHK, will happen the 30th of September 2018 in Tôkyô at the NHK Hall. The program will include one Kabuki drama, "Sanemori Monogatari", which will star Matsumoto Kôshirô, Nakamura Kazutarô, Kamimura Kichiya, Matsumoto Kingo and Nakamura Kikaku [more details]. 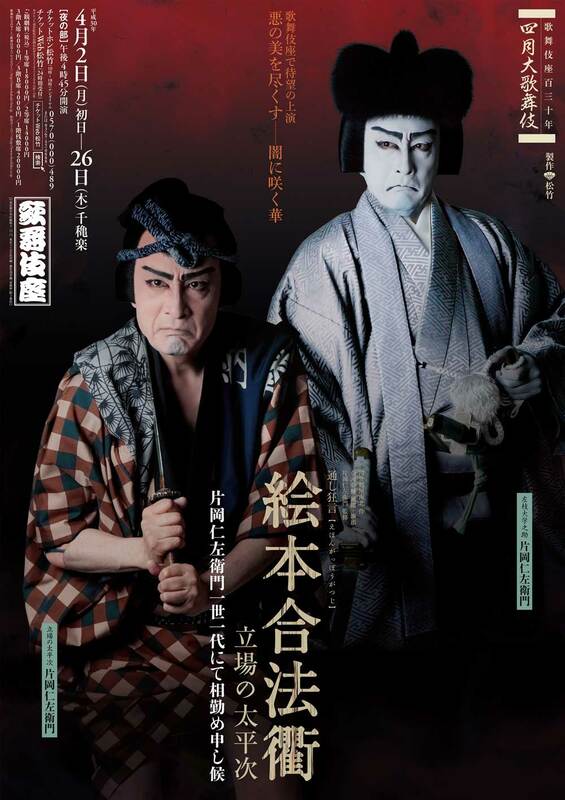 Ichikawa Ennosuke will perform with Fujima Kanjûrô VIII at the Hakataza the 30th of August 2018 in two Kabuki Buyô dances, "Tanemaki Sanbasô" and "Yoshinoyama". These performances are part of a festival of Traditional Arts called KIWAMI~Koten Geinô no Sekai (KIWAMI, the World of Classics Entertainment). A short summer program called "Family Festival - Parents and Children Enjoying Kabuki Together" will be staged at the Nissay Theatre from the 10th to the 12th of August 2018 [more details]. The 1st edition of the Tsuta no Kai (literally "the Ivy Association"), a gala program starring Ichikawa Tsutanosuke III, will happen the 16th of August 2018 in Tôkyô at the Nihonbashi Kôkaidô. The two guests will be Nakamura Kazutarô and Onoe Ukon [more details]. The section in English of "NARUTO" dedicated website has just opened! Onoe Matsuya will perform outside Kabuki, with the Gekidan*Shinkansen modern theater troupe, in "Metal Macbeth", a drama staged for the first time in 2006, written by Kudô Kankurô, directed by Inoue Hidenori and vaguely based on based on William Shakespeare's masterpiece "Macbeth". It will be Shakespeare with live Heavy Metal music! Onoe Matsuya will perform in this play from the 15th of September to the 25th of October 2018 at the IHI Stage Around Tôkyô, a theater belonging to the TV network TBS [more details]. The 3rd of July 2018, we could have celebrated the 210th anniversary of the passing away of Seki San'emon. This Kamigata actor, founder of the Seki Sanjûrô line of actors, died the 10th day of the 6th lunar month of the 5th year of the Bunka era, which was the 3rd of July 1808 in the western calendar. The 9th of July 2018, we could have celebrated the 210th anniversary of the passing away of Fujikawa Tomokichi I. This Kamigata onnagata actor, founder of the Fujikawa Tomokichi line of actors, died the 16th day of the 6th lunar month of the 5th year of the Bunka era, which was the 9th of July 1808 in the western calendar. The 15th of July 2018, we could have celebrated the 230th anniversary of the passing away of Nakamura Jûzô II. This Kamigata actor died the 12th day of the 6th lunar month of the 8th year of the Tenmei era, which was the 15th of July 1788 in the western calendar. 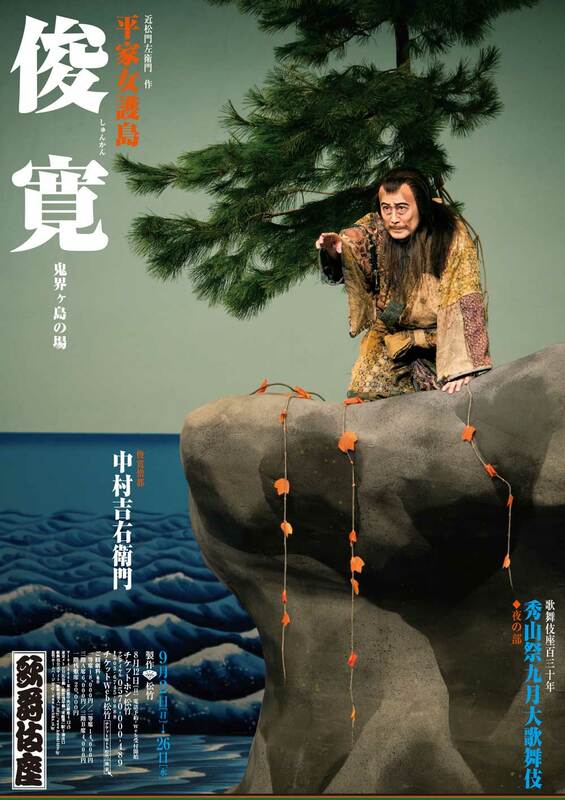 Chikamatsu Monzaemon's drama "Heike Nyogo no Shima" will be staged as a tôshi kyôgen in October 2018 at the National Theatre [more details]. The troupe will be led by Nakamura Shikan. The "Shikina no Ura" act was staged for the last time in October 1995 (only revival since the end of WWII). The other rarely-staged act, "Rokuhara Kiyomori Yakata", was staged three times, always at the National Theatre: April 1967, October 1995 and October 2007. The three programs for the August Grand Kabuki at the Kabukiza in August 2018 have been published [more details]. The main actors will be Matsumoto Kôshirô, Ichikawa Ennosuke, Nakamura Shichinosuke, Nakamura Senjaku, Bandô Yajûrô, Ichikawa Chûsha, Ichikawa Komazô, Kataoka Ichizô, Kataoka Kamezô, Nakamura Shidô and Ichimura Manjirô. 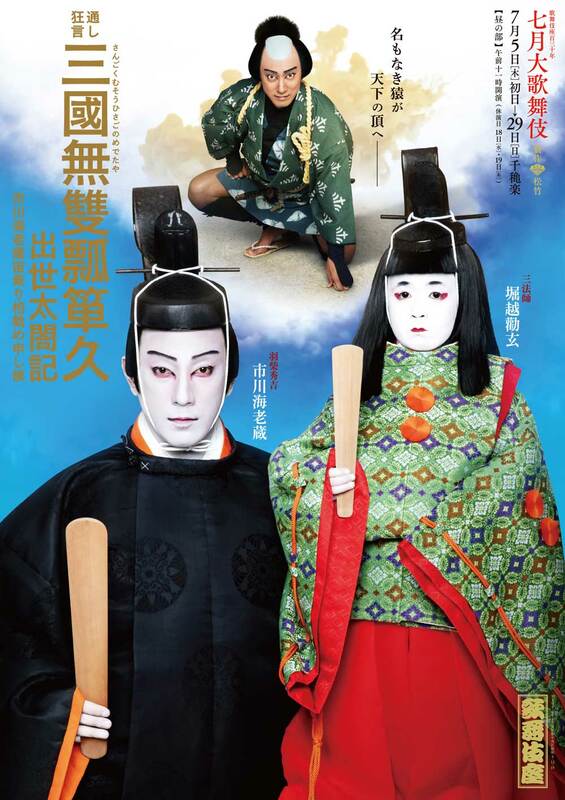 There will be a newly-created Kabuki drama entitled "Shinjû Tsukiyo no Hoshinoya", the revival of Hôjô Hideji's Shinkabuki drama "Oiransô" and, the highlight of these performances, the staging of Tsuruya Nanboku IV's spectacular masterpiece "Kamikakete Sango Taisetsu" with Matsumoto Kôshirô, Nakamura Shichinosuke and Nakamura Shidô in the roles of Satsuma Gengobê, Koman and Sasanoya Sangorô. Waterways occupy as much as ten percent of Ôsaka's city area, and have played a crucial role in its development as a strategic point in land and water transportation. One of the most picturesque among the city's numerous rivers and canals is the Dôtonbori, which flows today through Ôsaka's vibrant entertainment district. From the Edo period in the 17th century, rows of theaters formed along the river, and the area became the center for both Kabuki and Bunraku. 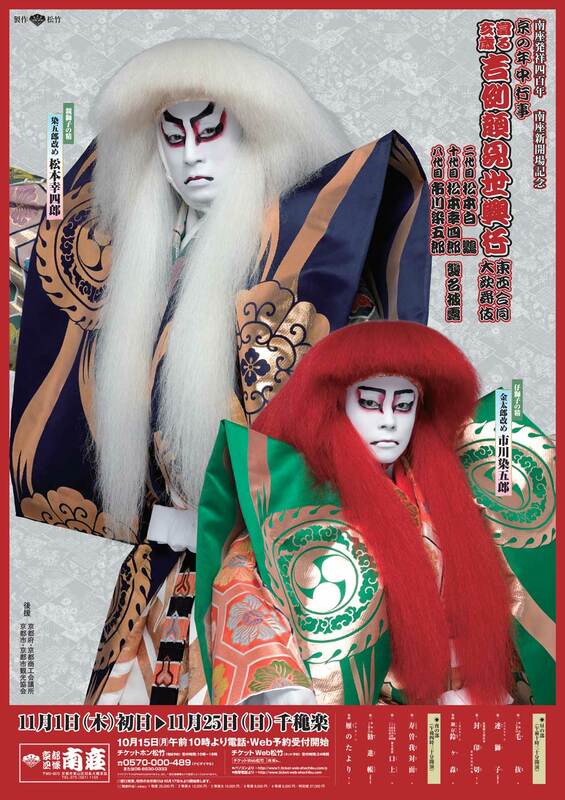 It is a custom to do funa norikomi before July Grand Kabuki at the Shôchikuza [more details]. Actors in the July casting, led by Matsumoto Hakuô and Matsumoto Kôshirô, arrived at the theater the 29th of June 2018 in a colorful boat parade, applauded by fans and spectators on the bridges or the banks [pictures and more details in Japanese]. The 5th edition of the Shô no Kai, a gala program which stars Nakamura Tomijûrô V's son Nakamura Takanosuke, will happen in Tôkyô at the National Nô Theatre the 1st of September 2018. Nakamura Takanosuke will perform in "Kumasaka" (shimai) and "Yoshinoyama" (the role of the fox Tadanobu). His sister Watanabe Aiko will perform in "Komori" and "Yoshinoyama" (the role of Shizuka Gozen). The long-time NHK announcer Kasai Seiji will be a guest in charge of all the talking [more details]. The 4th edition of the Sôchôkai (literally "the Two Butterflies Association"), which stars Nakamura Kashô and his brother Nakamura Tanenosuke, will happen the 4th and the 5th of August 2018 in Tôkyô at the National Theatre [more details]. The Tôkyô Series, a series of baseball games at the Tôkyô Dome (last game the 24th of June) with two Tôkyô teams, the Yakult Swallows and the Yomiuri Giants, met the Kabuki world for the first time! The mascots of each team appeared wearing kabuki costumes and a special kumadori was designed for each team [pictures and more details in Japanese]. Nakamura Shikan will perform outside Kabuki in September 2018. He will play from the 2nd to the 26th of September 2018 at the Shinbashi Enbujô the role of Othello in William Shakespeare's eponymous drama "Othello". Ichikawa Udanji in "Sangoku Musô Hisago no Medetaya". Ichikawa Ebizô and his son in "Sangoku Musô Hisago no Medetaya". Nakamura Shidô in "Sangoku Musô Hisago no Medetaya". Ichikawa Ebizô in "Genji Monogatari". The 20th edition of the summer program of the association Ne no Kai (the Sound Association) will happen the 11th and the 12th of August 2017 [more details]. Bandô Yajûrô is part of the casting of the movie "Shinpan", which was directed by John Williams and released in Japan the 30th of June 2018. This movie was based on Franz Kafka's novel "The Trial". The 18th of June 2018, we could have celebrated the 250th anniversary of the passing away of Bandô Hikosaburô II. This Edo actor died the 4th day of the 5th lunar month of the 5th year of the Meiwa era, which was the 18th of June 1768 in the western calendar. The 10th of May 2018, we could have celebrated the 200th anniversary of the premiere of Sakurada Jisuke II's Tokiwazu-based dance-drama "Sono Sugata Hana no Utsushie", commonly called "Mitsu Ningyô" (literally "The Three Puppets"). It was staged for the first time from the 5th day of the 4th lunar month of the 15th year of the Bunka era in Edo at the Nakamuraza [casting]. The 5th day of the 4th lunar month of the 15th year of the Bunka era was the 10th of May 1818 in the western calendar. From the 9th to the 15th of September 2018 in Moscow at the Mossovet Theater. From the 19th to the 22nd of September 2018 in St. Petersburg at the Tovstonogov Bolshoi Drama Theater. Reminder: There will be Grand Kabuki in September 2018 in France Paris at the Palais de Chaillot from the 13th to the 19th of September 2018 [more details]. These performances will be part of a long series of cultural events entitled "Japonismes 2018" to mark the 160th anniversary of diplomatic relations between Japan and France. Nakamura Shichinosuke and Nakamura Shidô will perform in "Narukami" and "Kasane". 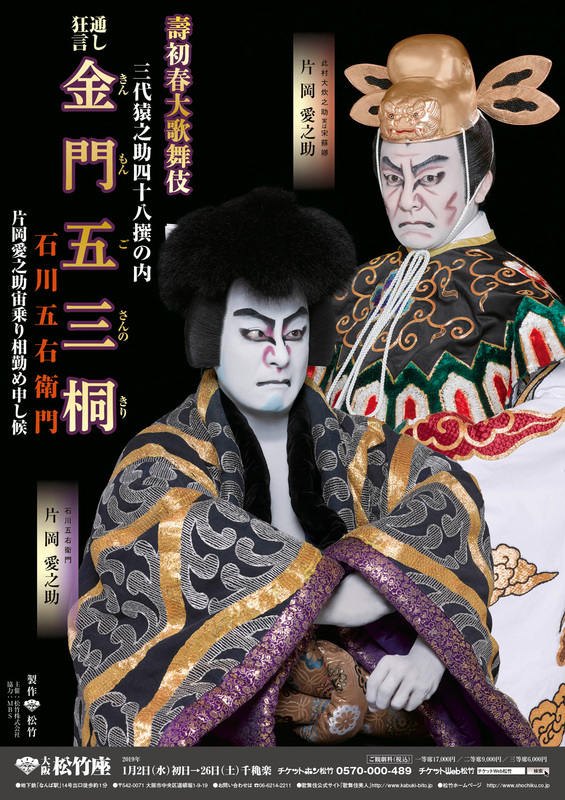 "Shusse Taikôki", an old classic set in the sekai of the Taikôki, which was not staged since the Taishô era, will be revised, revived and entitled "Sangoku Musô Hisago no Medetaya". The "Genji Monogatari", a family classic for the young star Ichikawa Ebizô, will make the evening program. There was an important funa norikomi on the Hakata River in Fukuoka the 30th of May 2018, before June Grand Kabuki at the Hakataza which will celebrate the shûmei of Matsumoto Hakuô II and his son Matsumoto Kôshirô X in Fukuoka [more details]. Actors on colorful boats were applauded by fans and spectators on the bridges or the banks of the Hakata river [more details with pictures]. "Beginners' Kabuki for Business Person" the 8th of June, with a special session starting at 18:30 instead of the usual 11:00 or 14:30. "Discover KABUKI" the 15th of June, with audio earphone service not only in Japanese or English but also in Chinese, Korean, Spanish and French. There will be before the staging of "Renjishi" a Kabuki guidance on stage entitled "how to appreciate Kabuki in English", in Japanese and English with Bandô Minosuke and the TV personality Kisa Ayako. There will a multilingual week from the 16th to the 24th of June, with audio earphone service in Japanese, English, Chinese, Korean, Spanish and French. Kataoka Ainosuke and Nakamura Kazutarô will be on tour in the western provinces in September 2018 [more details]. Matsumoto Hakuô II, Matsumoto Kôshirô X and Ichikawa Somegorô VIII will celebrate their shûmei in Kyôto in November 2018 (first month of the 2018 kaomise in Kyôto). Second month of the 2018 kaomise in Kyôto in December 2018. Bandô Tamasaburô Tokubetsu Kôen, Special Performances for Living National Treasure Bandô Tamasaburô in March 2019. 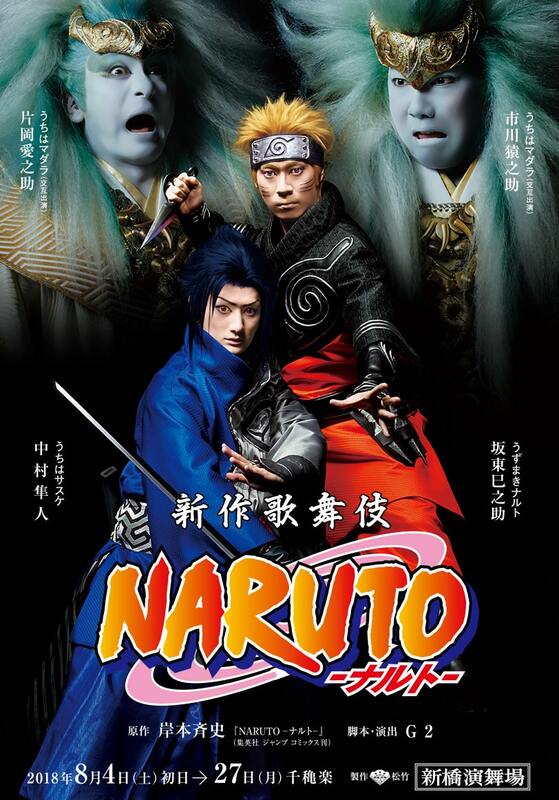 The Kabuki version of Kishimoto Masashi's internationally popular manga "NARUTO", under the supervision of G2 (both writer and director), will be staged in June 2019, starring Bandô Minosuke and Nakamura Hayato in the roles of Uzumaki Naruto and Uchiha Sasuke. Chôkabuki (literally Ultra-Kabuki) in August 2019 with Nakamura Shidô sharing the stage with the virtual 3D creature Hatsune Miku. Hanagata Kabuki, Young Actors Kabuki in September 2019. 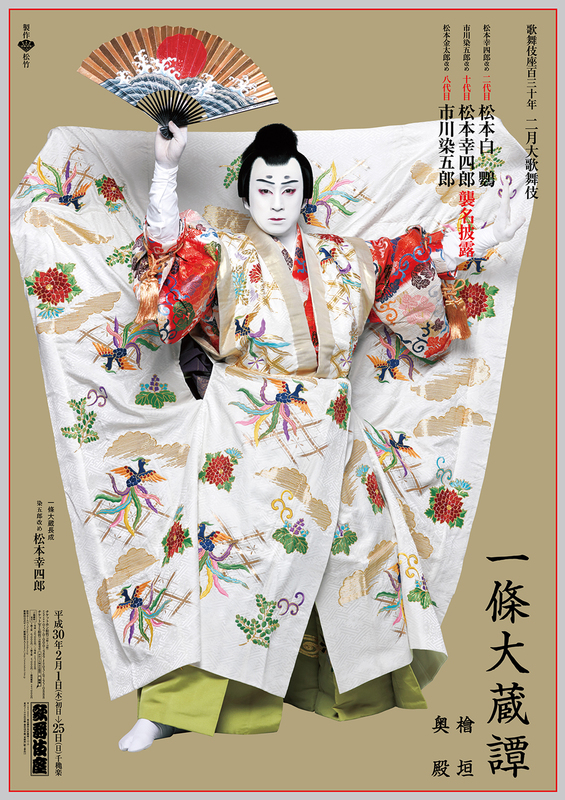 6th edition in June 2018 in the city of Matsumoto at the Matsumoto Performing Arts Centre of a Kabuki program called Shinshû Matsumoto Grand Kabuki (Shinshû is an old name for the province of Nagano, whose main city is Matsumoto), which happens every two years since July 2008. It will be the same program as the 16th edition of the Cocoon Kabuki in Tôkyô [more details]. They are cute or creepy. They prance around street fairs, sporting events, community gatherings and tourist destinations. They reprensent prefectures, cities, museums, schools, institutions ... even militaries forces or prisons. If you go to Japan, you are very likely to meet a few of them. I am talking about the yuru-kyara, the mascots, which have invaded Japan during the 2010s and are still on the rise. The yuru-kyara was made up of two real words, yurui meaning loose or relaxed, and kyara, a word coming from English and meaning character. The mascots are everywhere ... and we would like to report the "birth" of Minamîna, the official mascot for the Minamiza. Doesn't it look like a kind of Mr. Potato Head [picture]? 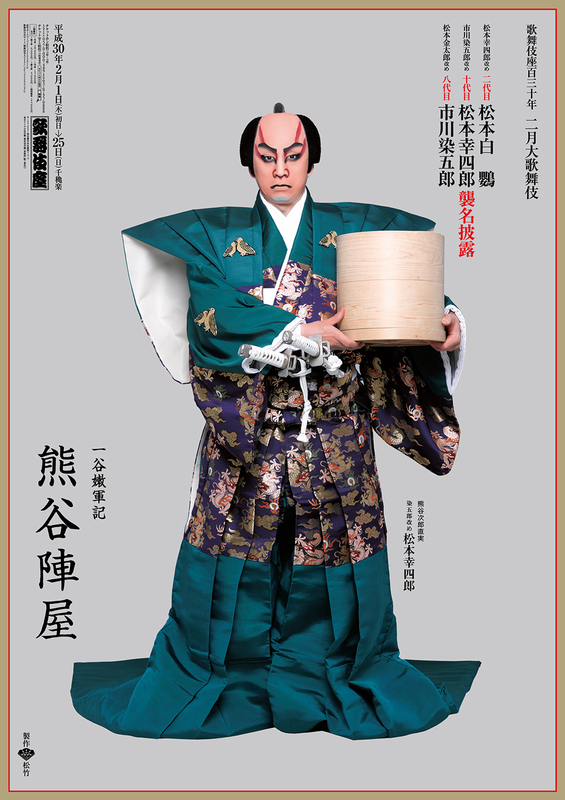 The program for the 28th edition of the Kamigata Kabukikai (the Kamigata Kabuki Association), a summer program in Ôsaka at the National Bunraku Theatre in August 2018 which stars Kamigata Kabuki stars' disciples in the leading roles with the guidance of Kataoka Nizaemon, Kataoka Hidetarô and Kataoka Gatô, has been published [more details]. The program for the 24th edition of the common program for 2 associations, the Chigyokai (the Young Fishes Association) and the Kabukikai (the Kabuki Association), which stars stars' disciples in the leading roles at the National Theatre in August 2018, has been published [more details]. The 4th edition of the Ken no Kai, which stars Onoe Kikugorô VI's great-grandson Onoe Ukon, will happen the 26th and the 27th of August 2018 in Tôkyô at the National Theatre. Ken no Kai literally means "Ken's Association" with Ken being the first ideogram in Onoe Ukon's real first name Kensuke. Nakamura Kikaku, Nakamura Kazutarô, Kamimura Kichiya and Arashi Kitsusaburô will be the guest stars [more details]. 4th edition of the gala of the Sora no Kai (literally "the Sky Association"), which stars Kataoka Matsujûrô, Kataoka Senjirô and Kataoka Senju, Kataoka Yûjirô, Kataoka Rikiya and Kataoka Tôjûrô. They will perform from the 2nd to the 5th of August 2018 in Ôsaka at the Kintetsu Art Kan [more details]. These performances are entitled Abeno Kabuki (Abeno is the name of a famous district in Ôsaka). The rarely-produced drama "Nazo no Obi Chotto Tokubê" will be staged under the guidance of Living National Treasure Kataoka Nizaemon, Kataoka Hidetarô and the the furitsuke Yamamura Tomogorô III. The 2nd of May 2018, a ceremony was held at the Kobikichô Hiroba, the shopping plaza in the 2nd floor basement beneath the Kabukiza to celebrate the unveiling of a new giant paper lantern. This new lantern, 2.7 meters high and 2.2 meters wide, the 2nd generation made by the Yoshinoya lantern-making company, replaced the first lantern that was hung there 5 years ago [picture | pictures and more details in Japanese]. The series of 10 62-yen stamps. 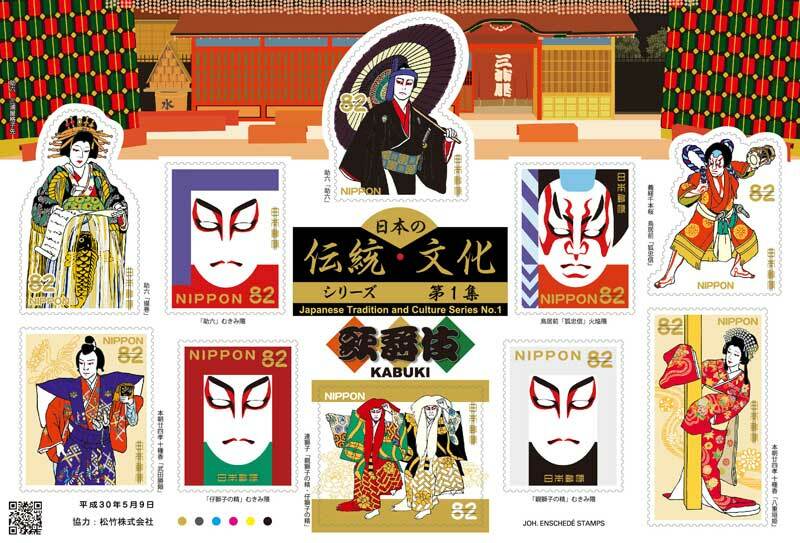 The series of 10 82-yen stamps. Matsumoto Hakuô II and Matsumoto Kôshirô X will celebrate their shûmei in Ôsaka at the Shôchikuza in July 2018. Matsumoto Hakuô II will play the role of Kôchiyama Sôshun in the eponymous drama "Kôchiyama". His son Matsumoto Kôshirô X will play the roles of Musashibô Benkei and Kawachiya Yohê in "Kanjinchô" and "Abura no Jigoku" [more details]. Kawatake Mokuami's drama "Nozarashi Gosuke", which was staged for the last time more than 20 years ago, in May 1998 at the Kabukiza. The leading eponymous role of Nozarashi Gosuke will be played by Living National Treasure Onoe Kikugorô. Uno Nobuo's drama "Kôdan Yomiya no Ame", which was staged for the last time almost 24 years ago, in August 1994 at the Kabukiza. The role of Ryûtatsu will be played by Nakamura Shikan. A dedicated website has just opened! The two guest stars, Ichikawa Ennosuke and Kataoka Ainosuke, will alternatively play the same role of Uchiha Madara. Pictures of the Kabuki Uzumaki Naruto and Uchiha Sasuke have been published [pictures and more details in Japanese]. Pictures of the Kabuki Uchiha Madara have been published [pictures and more details in Japanese]. 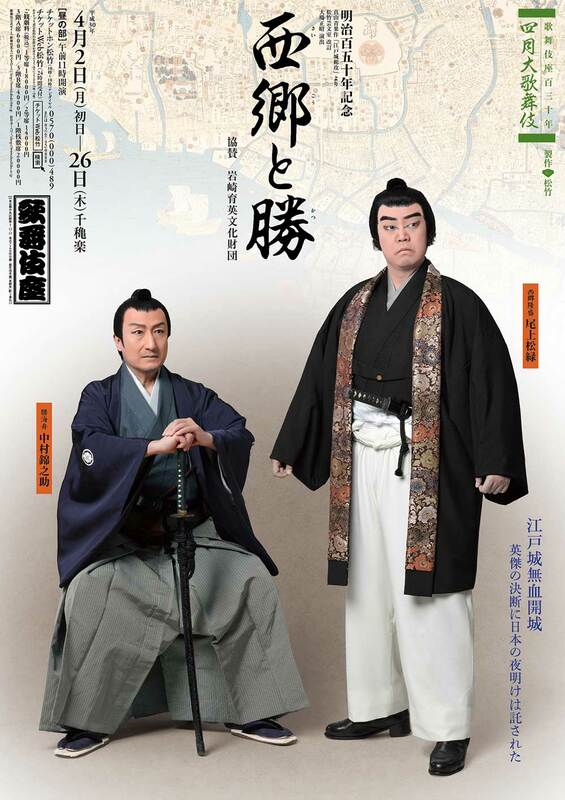 Two non-Kabuki actors will perform in this drama: Ichinose Hidekazu and Kashima Noritoshi. Ichikawa Ebizô and his son Horikoshi Kangen celebrated the 20th of April 2018 the 1080th anniversary of the foundation of the Narita-san Shinshôji Temple, where the Deity Fudô Myôô is worshipped. Ichikawa Ebizô went there in a special Keisei line train called "Danjûrô Train". This special train was used for the first time at the time of Ichikawa Ebizô's grandfather Ichikawa Danjûrô XI's shûmei. Ichikawa Ebizô also performed, along with Ôtani Hiromatsu, within the precincts of the temple in the dance "Renjishi" [pictures and more details in Japanese]. There is a strong relationship between this temple and the Ichikawa Danjûrô/Ichikawa Ebizô lines of actors. The Genroku Edo star Ichikawa Danjûrô I, who was born into a wealthy merchant family with ties to the Narita area, was said to be a devout Buddhist with a particular devotion to Fudô Myôô, to whom he gave credit for the safe birth of his son Kuzô, who went on to become Ichikawa Danjûrô II. The program for the July 2018 educational Kabuki program at the National Theatre, called Kabuki Kanshô Kyôshitu ("Kabuki appreciation class") has been published. Chikamatsu Monzaemon's drama "Nihon Furisode Hajime" will be staged with Nakamura Tokizô and Nakamura Kinnosuke [more details]. Nakamura Shikan and his two sons, Nakamura Hashinosuke and Nakamura Fukunosuke, went to the Konpira Shrine the 6th of April 2018 to pray for the success of April 2018 performances at the Kanamaruza, where they were about to celebrate their shûmei from the 7th of April. Afterwards, The actors were paraded in the streets of Kotohira in rickshaws [pictures and more details in Japanese|more details about the performances]. Moreover, these 3 actors were the big chiefs of the Kotohira Police Station in Kotohira for 1 day the 10th of April 2018 [pictures and more details in Japanese]. The first edition of the Takenosuke no Kai, a gala program which will star Bandô Takesaburô's disciple Bandô Takenosuke III, will happen in Ôsaka the 4th of August 2018 at the Daimaru Shinsaibashi Theater [more details]. The Kabuki TV program Kabuki Kool, which is produced by NHK World TV, will have a 5th season in 10 episodes. It hosts the young star Kataoka Ainosuke and the first episode of the new season was broadcasted the 4th of April 2018. The next episode, about Kabuki conventions, will be broadcasted the 2nd and the 30th of May 2018, four times each day at 04:30 08:30 16:30 and 22:30 (UTC) [more details]. Haruka Christine, who was the female host for the previous 4 seasons, has been replaced by Sarah Alainn for the 2018 season. Onoe Ukon will perform outside Kabuki from the 6th to the 22nd of July 2018 in Tôkyô at the Kinokuniya Southern Theatre in Quiara Alegría Hudes's drama "Water by the Spoonful". This drama will be directed by G2 (who has also translated the script in Japanese). Onoe Kikugorô in the role of Benten Kozô Kikunosuke. Ichikawa Ebizô in the 5 roles of "Narukami Fudô". At the Kabukiza Gallery (5th floor of the Kabukiza building), a special exhibition about Kabuki during the 30 years of the Heisei era will start from the 3rd of May 2018. It is very likely to end with the Heisei era (31st of December 2018). April 2018 celebrated the successful comeback on stage of Ichikawa Ennosuke, in Ôsaka at the Shôchikuza. The young star performed there the Sûpâ Kabuki Sekando drama "ONE PIECE" [pictures and more details in Japanese]. The programs for the Grand Kabuki Tours in the eastern and central provinces in July 2018 have been published! Nakamura Shikan VIII and two of his three sons, Nakamura Hashinosuke IV and Nakamura Fukunosuke III, will celebrate their shûmei in different central cities [more details]. Onoe Kikunosuke, Ichikawa Danzô, Bandô Hikosaburô and Nakamura Baishi will perform in different eastern cities [more details]. The program for the June 2018 educational Kabuki program at the National Theatre, called Kabuki Kanshô Kyôshitu ("Kabuki appreciation class") has been published. "Renjishi" will be staged with Nakamura Matagorô and Nakamura Kashô in the roles of the father shishi and his cub [more details]. 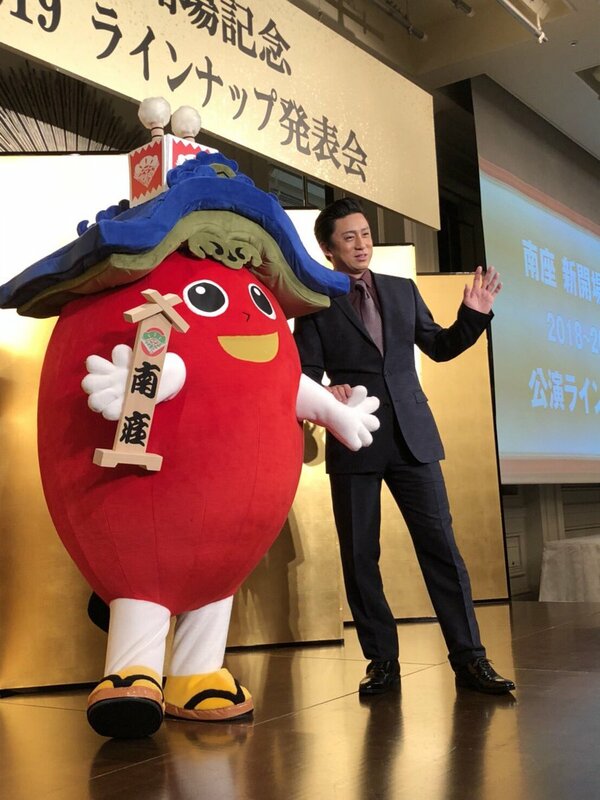 Living National Treasure Bandô Tamasaburô and Onoe Ukon were the award-winners of the Grand Award (Taishô) for the former actor and the Theater "New Face" Award (Engeki Shinjin Shô) for the latter actor of the 39th Matsuo Artistic Awards (Matsuo Geinô Shô). They received their prize the 28th of March 2018 at the ANA Intercontinental Hotel in Tôkyô. Matsumoto Kôshirô perform a sanbasô ritual dance in the precincts of the Kamigamo Shrine, ahead of the coming 3-generation Kôraiya shûmei in Kyôto (Kôraiya Sandai Shûmei) of Matsumoto Hakuô II, Matsumoto Kôshirô X and Ichikawa Somegorô VIII in Kyôto at the Minamiza in November 2018 [pictures and more details in Japanese]. Ichikawa Chûsha received the 18th of March 2018 at the Asakusa Kôkaidô the Incentive Award (Shôrei-shô) of the 34th Asakusa Artistic Awards (Asakusa Geinô Shô). During the same ceremony, the signed handprint of Nakamura Matagorô was taken and set into the Plaza of Stars (Sutâ no Hiroba in Japanese) on Orange Street (Orenji Dôri in Japanese) in front of the Asakusa Kôkaidô [pictures and more details in Japanese]. Nakamura Senjaku was one of the 8 award-winners of the 74th Japan Art Academy Awards (Nihon Geijutsuin Shô) for the year 2017. The world of Kabuki and the world of Otaku will collide for the third time in Kabuki history at the end of April 2018! Chôkabuki (literally Ultra-Kabuki) will be back! Nakamura Shidô will once again share the stage with the virtual 3D creature Hatsune Miku. They will perform together in a Chôkabuki dance-drama which will be entitled "Tsumoru Omoi Hana no Kaomise". This jidaimono will involve the fight for the imperial throne that is set in the Heian period. Nakamura Shidô and Hatsune Miku will play two roles each. It will staged at the Makuhari Messe the 28th and the 29th of April 2018, as part of the Niconico Chôkaigi 2018 event, an important yearly event for the Otaku tribes [more details]. Onoe Shôroku and Nakamura Kinnosuke in "Saigô to Katsu". Onoe Kikugorô and Nakamura Tokizô in "Ura Omote Sendai Hagi". Kataoka Nizaemon in "Ehon Gappô-ga-Tsuji". Oda Eiichirô's internationally popular manga "ONE PIECE", which got his first Kabuki adaptation by Ichikawa Ennosuke in October 2015/November 2015 at the Shinbashi Enbujô, will be staged one more in Ôsaka at the Shôchikuza in April 2018. The first time was in March 2016 in the same theater. Most of the actors will be Kabuki actors, with 3 non-Kabuki guest actors : Hira Takehiro, Kashima Noritoshi and Asano Kazuyuki [more details]. It will also be staged for the first time in Nagoya, in May 2018 at the Misonoza [more details]. There will be Kabuki performances in Madrid from the 27th of June to the 1st of July 2018. The Heisei Nakamuraza, led by Nakamura Kankurô and Nakamura Shichinosuke, with Kataoka Kamezô and Nakamura Tsurumatsu, will travel to Spain as part of the events celebrating the 150th anniversary of the establishment of diplomatic relations between Japan and Spain in 1868. They will perform in "Fuji Musume" and "Renjishi" at the Teatros del Canal in Madrid. The two programs for the April Grand Kabuki at the Kabukiza in April 2018 have been published [more details]. Living National Treasure Kataoka Nizaemon will do his isse ichidai performance for the roles of the villains Tateba no Taheiji and Saeda Daigakunosuke in Tsuruya Nanboku IV's masterpiece "Ehon Gappô-ga-Tsuji". The two programs for the Dankikusai May Grand Kabuki at the Kabukiza in May 2018 have been published [more details]. 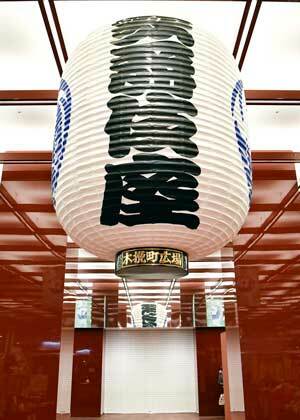 It will be the fifth Dankiku festival at the fifth Kabukiza since the passing away of Ichikawa Danjûrô XII. Two important events will be commemorated : the 1080th anniversary of the Narita-san Temple, where the Deity Fudô Myôô is worshipped, and the 330th anniversary of the birth of Ichikawa Danjûrô II (born in 1688). There is a deep connection between the the Narita-san Temple and the Ichikawa Danjûrô line of actors since Ichikawa Danjûrô I. The Minamiza will reopen in November 2018! Kabuki will be staged in both November 2018 and December 2018 to celebrate this long-awaited reopening. In November 2018, it will be the 3-generation Kôraiya shûmei in Kyôto (Kôraiya Sandai Shûmei) of Matsumoto Hakuô II, Matsumoto Kôshirô X and Ichikawa Somegorô VIII. Matsumoto Hakuô II and Matsumoto Kôshirô X will celebrate their shûmei in Fukuoka at the Hakataza in June 2018. Matsumoto Hakuô II will play the roles of the master of the Miuraya and Sôgorô in "Date no Jûyaku" and "Sakanaya Sôgorô". His son Matsumoto Kôshirô X will play the 10 roles of "Date no Jûyaku" and the leading role of the dance-drama "Kagami Jishi". The two Living National Treasures Kataoka Nizaemon and Sakata Tôjûrô will be the guest stars. The former will play the roles of the evil Yashio and Shunkan in "Date no Jûyaku" and "Shunkan". The latter will lead the kôjô [more details]. The famous character Hello Kitty and her cute friends will play Kabuki from the 10th of March 2018 at the Märchen Theater in Sanrio Puroland. It will be a new musical production entitled "KAWAII KABUKI - Momotarô by the Hello Kitty Troupe". A new character named Kabuki Nyanyarô, a character designated as a Kabuki Nyan’bassador (ambassador) will also make his debut on stage. It is worthy to report that Ichikawa Emisaburô will be in charge of the acting guidance and the voice of Nakamura Shidô will be used [more details]. The 14th of February 2018 the 125th Emperor of Japan Akihito and his wife the Empress of Japan Michiko went to the Kabukiza to enjoy "Kotohogu Sandai Kabuki no Nigiwai" in the evening program [pictures and more details in Japanese]. Living National Treasure Bandô Tamasaburô will perform in a special Buyô program from the 19th to the 20th of May 2018 in Kyôtango at the Tango Bunka Kaikan (Tango Culture Center) [more details]. Nakamura Takanosuke and Nakamura Tamatarô will perform at the Kanagawa Arts Theatre from the 24th to the 27th of March 2018 in a special Buyô program which is supervised by Fujima Kanjûrô VIII and entitled "SUGATA" (3rd edition) [more details]. Reminder: the year 2018 is the 130th year from the opening of the Kabukiza. More precisely, this anniversary will be celebrated the 21th of November 2018. Living National Treasure Sakata Tôjûrô Living National Treasure Nakamura Tôzô and Kataoka Gatô will appear on stage at the Kabukiza in February 2018 in the evening program in "Kabukiza Shibai no Nigiwai", which will be the lively and colorful kôjô for the shûmei of Matsumoto Hakuô II, Matsumoto Kôshirô X and Ichikawa Somegorô VIII. There will 6 Living National Treasures on stage for this kôjô! A new Celebration Curtain (iwai-maku) designed by Kusama Yayoi will be used in February 2018 at the Kabukiza the second month of the 3-generation Kôraiya shûmei (Kôraiya Sandai Shûmei) of Matsumoto Hakuô II, Matsumoto Kôshirô X and Ichikawa Somegorô VIII [pictures and more details in Japanese]. It was reported in Bandô Yajûrô’s blog that the 20th of January 2018 at the Kabukiza, during the kôjô for the 3-generation Kôraiya shûmei (Kôraiya Sandai Shûmei) of Matsumoto Hakuô II, Matsumoto Kôshirô X and Ichikawa Somegorô VIII, the new Hakuô told the audience that Prime Minister Abe Shinzô was present that evening. Then, just at the end of the speech of the new Kôshirô, in the midst of the applause, a unexpected kakegoe from the 1st floor seats called out "Senryô yakusha! Sannin awasete sanzenryô!" ("An actor worth a thousand ryô! The three of you together are worth three thousand ryô!"). According to Bandô Yajûrô, it was the voice of the Prime Minister. The 16th edition of the original Cocoon Kabuki will happen in May 2018 at the Theatre Cocoon [more details]. These performances recreate the atmosphere of the Edo koshibai and brings the actors closer to the audience. The play "Kirare Yosa" will be revised by the playwright Kushida Kazuyoshi. It is noteworthy to report that Nakamura Kankurô will unusually not take part in these performances. In January 2018 at the Kabukiza, Matsumoto Kin'ya III and Matsumoto Kin'ichi III, two disciples of the Kôraiya guild, respectively took the names of Matsumoto Kôemon II and Matsumoto Kôzô II, playing the roles of Hiraoka Gôzaemon and Mihara Ariemon in the drama "Sumôba", which was staged in the evening program of the 3-generation Kôraiya shûmei (Kôraiya Sandai Shûmei) of Matsumoto Hakuô II, Matsumoto Kôshirô X and Ichikawa Somegorô VIII. The Zenshinza will perform in May 2018 at the National Theatre in Kawatake Mokuami's zangirimono "Ningen Banji Kane no Yo no Naka" [more details]. Nakamura Kazutarô took part in a parade in Ôsaka the 10th of January 2018, which was part of the Tôka Ebisu Festival at the Imamiya Ebisu Shrine, which is located in the Naniwa Ward of Ôsaka and is commonly (and affectiously) called Ebessan by the people of Ôsaka. The Tôka Ebisu Festival was held from the 9th to the 11th of January 2018. Tôka meaning the 10th day in Japanese, this festival is usually held around the 10th of January and it is extremely popular in Ôsaka. During this festival sacred bamboo branches are sold to business people. The branches, known as fukusasa, are decorated with lucky symbols. The young actor was paraded through shopping and entertainment districts on a special palanquin called hoe kago, surrounded by people singing a simple catchy folk song [more details in Japanese and pictures]. The 10th of January at the Kabukiza and the 12th of January at the Asakusa Kôkaidô, there were visits to Kabuki by two groups of geisha. The geisha from the hanamachi of Shinbashi, Yoshi-chô, Akasaka, Kagurazaka and Mukôjima came at the Kabukiza. The geisha from the hanamachi of Asakusa went to the Asakusa Kôkaidô. This kind of visit by a group of geisha is called Sôken (literally "global viewing"). The geisha went to enjoy Kabuki and the audience were delighted to see them in the theater. The new Kôshirô in the role of Ichijô Ôkura Naganari in "Ichijô Ôkura Monogatari". The new Kôshirô in the role of Kumagai Jirô Naozane in "Kumagai Jin'ya". 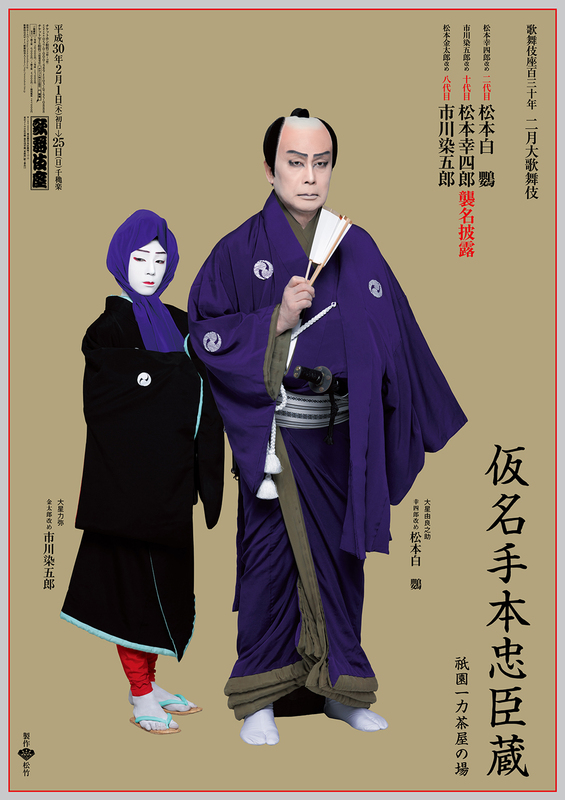 The new Hakuô and the new Somegorô in the roles of Ôboshi Yuranosuke and Ôboshi Rikiya in "Gion Ichiriki Jaya". The 24th of April 2018 in Kyôto at the ROHM Theatre [more details]. The 26th of April 2018 in Noda at the Noda City Culture Center [more details]. Onoe Ukon, the grandson of Kiyomoto Enjudayû VI and the son of Kiyomoto Enjudayû VII, will take the name as a music master of Kiyomoto Eijudayû VII the 26th of February 2018 at the Kabukiza. There will be a special Kiyomoto gala program, which will also commemorate the 32nd anniversary (33rd memorial services) of the passing away of Kiyomoto Enjudayû VI. This program is entitled "Enjukai". Onoe Ukon's elder brother Kiyomoto Takahiro will take the name of Kiyomoto Saiju in the same program. Living National Treasure Onoe Kikugorô, Living National Treasure Kataoka Nizaemon, Onoe Kikunosuke, Nakamura Kankurô, Nakamura Shichinosuke, Ichikawa Ennosuke, Onoe Shôroku and Nakamura Kazutarô will perform in this program [more details]. New year kagami-biraki the 2nd of January 2018 in Asakusa for Nakamura Kinnosuke, Onoe Matsuya, Bandô Minosuke, Nakamura Kashô, Nakamura Tanenosuke, Nakamura Yonekichi, Nakamura Hayato, Nakamura Umemaru and Bandô Kamezô [more details]. Parade (oneri) in Fukuoka in the Kawabata area, which is centered around Hakata's oldest shopping arcade since the mid-1950s, for Nakamura Kankurô, Nakamura Shichinosuke, Nakamura Senjaku, Onoe Matsuya, Ichikawa Monnosuke, Kataoka Kamezô, Nakamura Kotarô, Bandô Shingo, Nakamura Hashinosuke, Nakamura Fukunosuke, Nakamura Tsurumatsu [pictures and more details in Japanese]. Kataoka Ainosuke will perform outside Kabuki, from the 27th of April to the 26th of May 2018 at the Tôkyô Metropolitan Theatre in Mitani Kôki's drama "Sake to Namida to Jikiru to Haido" (entitled in English "JEKYLL & HYDE & so on"). Nakamura Shidô will perform outside Kabuki from the 3rd to the 26th of March 2018 at the Shinbashi Enbujô in the drama "Edo wa Moete-iru ka TOUCH AND GO". Nakamura Kikaku will perform outside Kabuki, from the 8th to the 18th of February 2018 in Tôkyô at the Galaxy Theatre and from the 23rd to the 25th of February 2018 in Ôsaka at the Morinomiya Piloti Hall, in Nishida Daisuke's drama "Kake Hayabusa Hito Yamato". He will also perform in the Japanese version of Anna Ziegler's drama "Photograph 51", which will be directed by Sarna Lapine and which will be staged in Tôkyô at the Theatre West of the Tôkyô Metropolitan Theatre from the 6th to the 22nd of April 2018 and in Ôsaka at the Umeda Arts Theater from the 25th to the 26th of April 2018. The 22nd of February 2018, we will celebrate the 300th anniversary of the passing away of Shinozuka Jirozaemon I. This important Kamigata actor died the 23rd day of the 1st lunar month of 3rd year of the Kyôhô era, which was the 22nd of February 1718 in the western calendar. The 27th of February 2018, we will celebrate the 200th anniversary of the passing away of Nakayama Yoshio I. This important Kamigata actor died the 23rd day of the 1st lunar month of 1st year of the Bunsei era, which was the 27th of February 1818 in the western calendar. They are cute or creepy. They prance around street fairs, sporting events, community gatherings and tourist destinations. They reprensent prefectures, cities, museums, schools, institutions ... even militaries forces or prisons. If you go to Japan, you are very likely to meet a few of them. I am talking about the yuru-kyara, the mascots, which have invaded Japan during the 2010s and are still on the rise. The yuru-kyara was made up of two real words, yurui meaning loose or relaxed, and kyara, a word coming from English and meaning character. The mascots are everywhere ... and we would like to report the "birth" of REN-G, the official mascot for the 2019 Rugby World Cup. Phonetically, Ren-G is renjî ... which is close to "Renjishi". This is a "double mascot" which symbolizes the two shishi of the dance-drama "Renjishi", the two mythical, lion-like creatures that "bring happiness and ward off evil" [pictures and more details in Japanese].